Recorded live at Warren Haynes' 12th annual X-mas jam in Asheville, NC at the Thomas Wolfe Auditorium, The Benefit Convert Vol. 2 is the second CD release in an on-going series documenting the annual concerts. As with each previous benefit, all proceeds from this series of concerts and CD releases are to benefit Habitat for Humanity, an international non-profit organization dedicated to building housing for those in need of shelter. Like each of the benefits, the 20000 concert saw Warren Haynes put together a stellar lineup of musicians that featured Gov't Mule, Gregg Allman and the Allman Brothers Band, The Bottle Rockets, the Chiris Duarte Band and an Aquarium Rescue Unit reunion featuring Col. Bruce Hampton. Warren Haynes also welcomed very special guests: Mike Barnes, Audley Fred (Black Crowes) Kevn Kinney (Drivin' n' Cryin'), Dan Matrazzo, Edwin McCain, John Popper (Blues Traveler), Paul Riddle (Marshall Tucker Band) and Dave Schools (Widespread Panic). In addition, the Benefit Concert Vol. 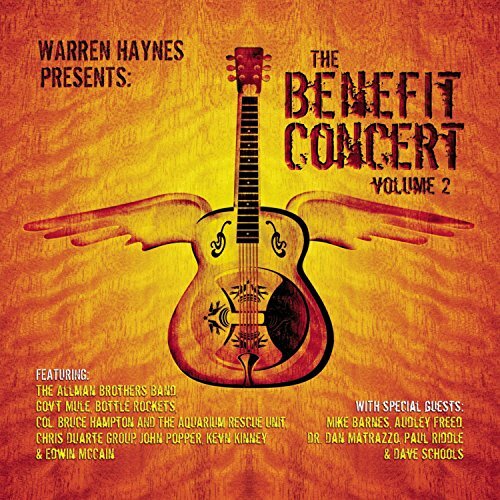 2 includes previously unreleased solo acoustic material by Warren Haynes himself.